Stacy Horn » Blog Archive » I’m Catching Up! I wanted to find an image of joy or peace. This was the first one I thought of. 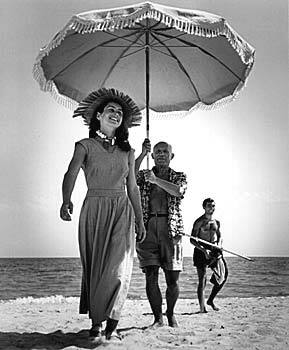 I’ve always loved this photograph of Francois Gilot and Picasso, and although there’s a lot more going on here, certainly a lot that could be read into it, she looks happy. I’ve managed to increase the number of boxes I get through in a day, so I think I can come home in mid-March. What do you think the chances are there’ll be the second storm of the century when I get home? Oh, please please please. Never let it be said that Picasso didn’t make at least one kind gesture to at least one of his wives! Ha! Yeah. Francois Gilot went on to marry Jonas Salk. She did alright. I admire her.